Dogs get old. It’s what happens when we take care of our pups, pay attention to their health and well-being, and do whatever we can to increase their longevity. We want to spend as many years as we can with our dogs and make sure those years are as full and happy as possible. This does mean, however, that our senior pups are more likely to reach the point where they suffer from age-related medical conditions, including dog dementia. Canine cognitive dysfunction, or CCD, is similar to Alzheimer’s disease in humans, and it tends to appear in older dogs as the brain ages. The symptoms can be heartbreaking, but there are ways to help treat your dog, make them comfortable, and improve their condition. Signs of CCD in dogs can include disrupted or unusual sleep cycles, changes in personality, unusual behavior or changes in normal behavior, accidents in the home, barking for no reason, getting lost in familiar places, anxiety, acting more withdrawn, and failing to respond to familiar commands or their own name among other things. If your dog is experiencing these issues, you should consult your veterinarian, as other medical conditions can share these symptoms. If your dog is diagnosed with CCD, then you should ask your veterinarian about steps you can take to make them more comfortable and provide treatment. 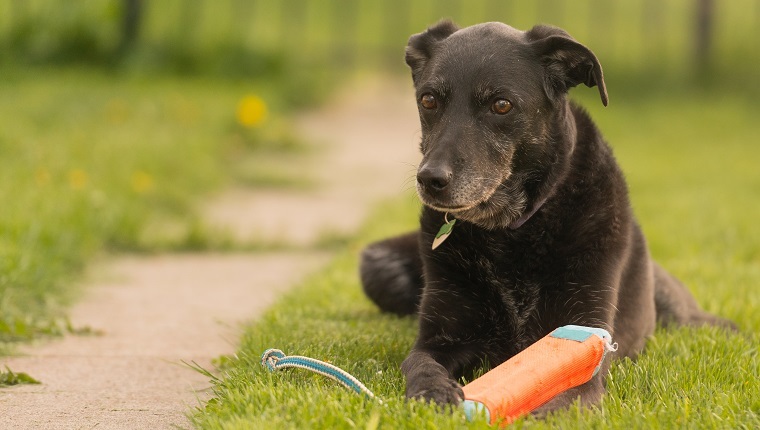 Dementia can be individual to each dog and often depends on how far advanced the condition is, so work with your vet to formulate an appropriate plan. Here are a few ways you may be able to help your dog with dementia that you should talk about with your veterinarian. One of the major symptoms of dementia in dogs is disorientation. Sticking to a schedule can help re-orient dogs, which may help prevent other symptoms, like anxiety, from worsening. Try to wake up at the same time each day, stick to a feeding schedule, go outside at the same time, and go to bed at the same reasonable hour. Staying on schedule may be difficult if your life is not so predictable, and it can also be thrown off if your dog’s sleep schedule is disrupted. However, developing a routine that you and your dog can stick to will help reduce your dog’s confusion, so try your best. There are certain medications that can help treat CCD and its symptoms. Anipryl, also known as Selegiline or selegiline hydrochloride, is a medication that treats Cushing’s disease in dogs, but it has also been effective in treating dementia. Many dogs even see improvement in cognitive function. Your vet may also discuss sleep aids or anti-anxiety medications to treat some of the symptoms associated with the disease. 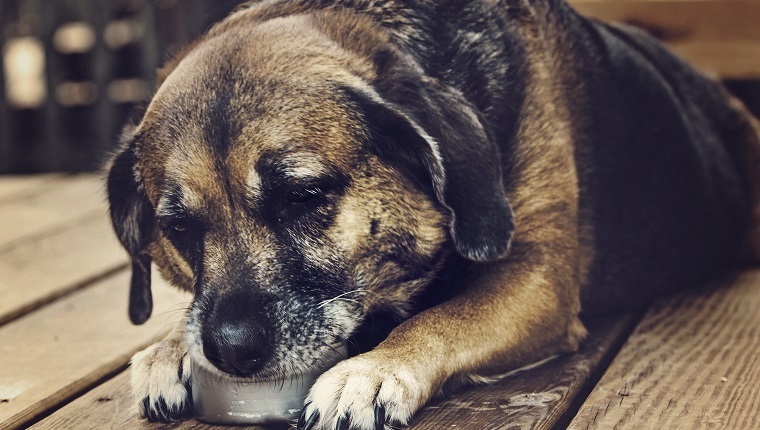 There are many natural supplements that address the symptoms of CCD without some of the potential side effects of medication, and your veterinarian may want to explore these options. Melatonin, for example, is a supplement that can help reduce restlessness at night, also known as “sundowning,” and improve sleep cycles. Coconut oil has been shown to have many health benefits, including improvement of cognitive function. Omega 3s have similar health-restoring properties, as do many foods and supplements that contain antioxidants, such as turmeric. Some vets even recommend canabidiol (CBD) oil. These are all options you should discuss with your veterinarian. Anxiety is a concerning symptom of dementia, and there are several ways to manage it. Routines, medications, and supplements can all be effective, but there are other options that may be effective, too. Some dog owners swear by acupuncture, aromatherapy, and even music therapy for keeping their dogs calm. 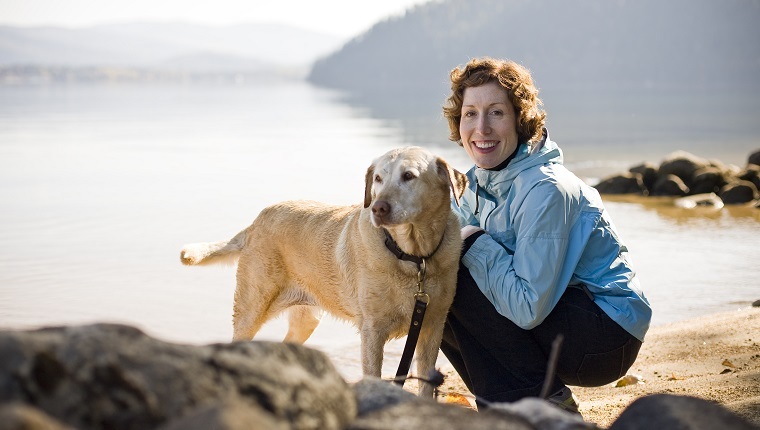 Thundershirts can help some dogs, as can regular walks and moderate exercise. Just be mindful of your dog’s preferences. If a new type of therapy is introduced, it can be an overload of new stimuli. Know your dog’s limitations and talk to your vet about how to adjust your treatment accordingly. Puzzle toys can be a good way to keep your old dog’s brain active and working, which can stave off the effects of CCD. These toys encourage interaction, which can also give your dog a minor physical challenge and keep the blood flowing to the brain. This is another treatment that requires you to know your dog’s limitations. If they become anxious about the added stimulus of the new toy, you may want to seek alternative treatment. 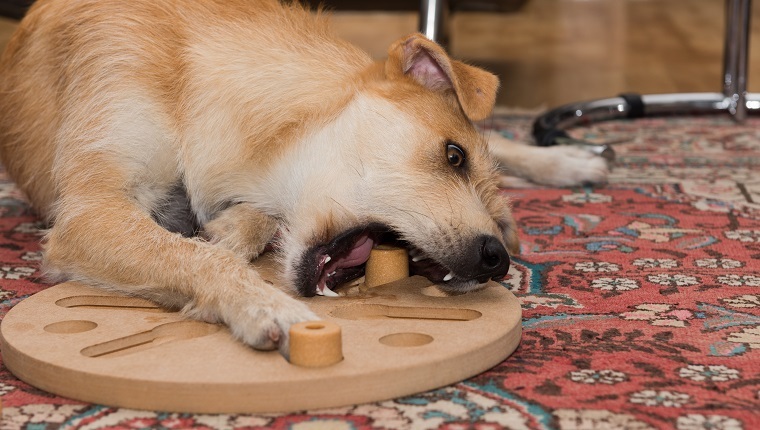 However, for many dogs with dementia, puzzle toys provide a much-needed brain workout. Much like sticking to a routine, a consistent environment can help dogs with dementia avoid becoming confused and allow them to reorient themselves. This means that you should keep furniture, dog beds, food and water bowls, and everything else around the house in relatively the same position. It’s not the best time to consider redecorating. Avoid clutter and stay organized. Don’t leave toys lying around and put your clothes in the laundry hamper. Also, be aware that guests can cause your dog to become confused and anxious, as they introduce new stimuli into your dog’s environment. When guests come over, be aware of your dog’s needs and reorganize after they leave. There is a delicate balance when it comes to play and training with dogs who suffer from dementia. You don’t want to overload them with stimulation, but keeping the brain active is very important for maintaining their cognitive function and fighting the advancement of CCD. Play sessions should be interactive and fairly short. 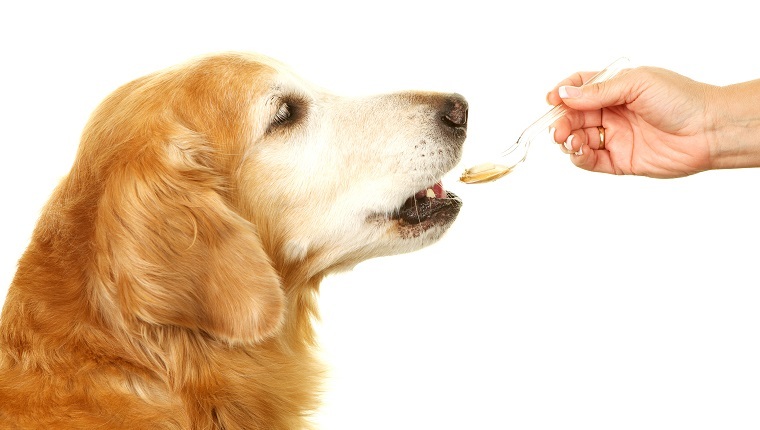 You’ll want to keep your dog engaged without putting too much stress on them, and that means knowing your dog’s preferences. Nose work is another great way to keep the brain active that shouldn’t cause anxiety. The same can be said of training sessions. Teaching an old dog new tricks is a great way to keep the brain active, but be mindful of limitations. Don’t get frustrated if your senior isn’t catching on like they used to, and if they show signs of anxiety, then pick another activity. Your veterinarian or a veterinary behaviorist can help give you some tips on how to approach these activities. Walks are beneficial for dogs at any age, but they are especially important for dogs who suffer from dementia, so long as they are short and brisk. A walk is a good opportunity to gently introduce some mild stimulation to the brain in the form of interesting smells, sights, and sounds. Let your dog sniff a bit and try to avoid tugging at the leash to hurry them along. This will help keep their mind active. The physical activity will be good for them, too. A short, brisk walk gets the blood flowing, which can increase oxygen and glucose in the brain. Just make sure that the walk isn’t too long and strenuous, or the muscles will start to take in much of the oxygen that the brain needs. What other ways do you help fight the effects of dementia in your dog? What kind of treatment has your veterinarian recommended? Let us know in the comments below!